White spots can be a sign that the surface of your teeth is losing minerals and can be an indication of tooth decay. There are some different reasons why white spots can occur including consuming too many acidic foods and sugar, having dry mouth, and poor oral hygiene. If you have white spots on teeth, do not let them keep you from smiling. You can easily remove these white spots from your teeth by applying some of the following home remedies. If you have white spots on teeth, you do not need to be so worried because these spots are not harmful in most cases. 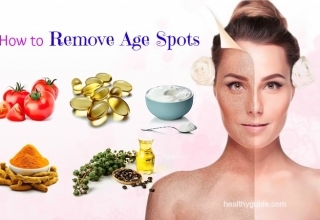 Now, keep both of your eyes on this interesting article on Healthy Guide and then try to apply some of the best ways on how to get rid of white spots on teeth naturally. 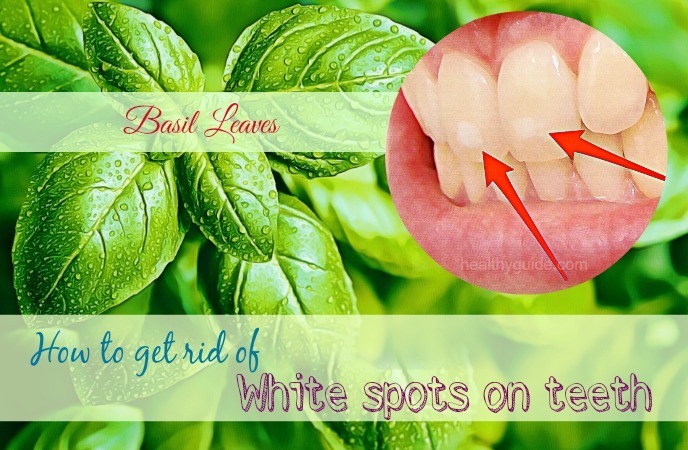 Here is our article about natural remedies for white spots on teeth which will show you how to remove these spots from your teeth step by step. Dry mouth: When the mouth is dry, the pH level of your mouth will be imbalanced. Then, bacteria will attack your teeth’s enamel with their acid. Poor oral hygiene: If you do not clean your mouth regularly, the plaque buildup will occur in your teeth. Consuming acidic foods: These acidic foods can cause white spots on teeth. Excessive fluoride: Fluoride is essential for keeping your teeth healthy, but excessive fluoride can result in white spots on teeth. Wearing braces: If you wear braces and do not follow a good dental hygiene, you will surely have white spots on teeth. This is as plaque may build up on places where you cannot brush your teeth well. Celiac disease: It is associated with teeth’s enamel defects, including white spots on teeth. Teeth whitening strips: If you often use these teeth-whitening strips, you may have white spots on your teeth. This is because these strips are rich in acidity, hence demineralizing your tooth’s enamel and causing white spots on them. Read on Top 23 Easy Yet Healthy Gluten Free Recipes You Should Try to discover some of the healthy gluten-free recipes for those with celiac diseases. This should be the first way on how to get rid of white spots on teeth at home fast that we want to mention in this article. Green tea can help you treat white spots on teeth effectively and naturally. It works as a natural bacteria killer and helps prevent the mouth from bacterial acids. You can use green tea rinse to prevent decaying and maintain oral hygiene. Leave it on for about 5 minutes before wringing out the tea bag. Apple cider vinegar can help kill oral bacteria thanks to its antibacterial properties. These bacteria release acids when your mouth gets dry, so they are responsible for demineralization. Apart from removing white spots on teeth, apple cider vinegar can clean the mouth and simultaneously kill pathogens that cause gum infection. Take one sip and then swish it around your affected area. 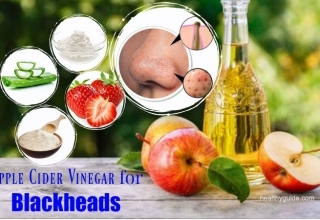 List of 30 Ways To Use Apple Cider Vinegar For Dandruff And Itchy Scalp, Hair Loss will show you some of the best ways to treat dandruff, hair loss and itchy scalp with the help of apple cider vinegar, so check it out! Lemon juice can cleanse sticky things such as plaque, oil and debris. It naturally removes white spots from your teeth. This is because lemon juice is rich in vitamin C, which is essential for strong oral health. Nowadays, many toothpaste brands use lemon juice as a main ingredient for increasing the cleaning effect. Leave it on for several seconds. Mix 3 tbsp. of lemon juice in a cup of warm water. Follow this remedy 2-3 times a day. If you want to know some of the best benefits of lemon water for health and beauty, read on Benefits Of Drinking Lemon Water – 19 Reasons To Drink It! According to a study about natural treatments for white spots on teeth , oil pulling has been used to remove white spots from the teeth for years. It also helps remove excessive calcium deposits and dirt from the teeth as well as prevents cavities and dark spots on teeth. Oil pulling can be performed with coconut, olive, oregano, mustard or peppermint essential oil. Take 2 tbsp. of organic coconut oil in the mouth. Then, swish the oil around your affected area for about 2-3 minutes. Follow this remedy daily after you wake up. According to a research, neem oil contains antibacterial properties, which are effective in killing off the bacteria that cause dental issues. Moreover, neem oil also contains astringent properties that help you get rid of white spots on teeth. Add 3 drops of neem oil to some of your toothpaste. Follow this home remedy daily until white spots on your teeth have disappeared. If you are unsure about how to get rid of white spots on teeth fast, then you can take advantage of neem leaves. Due to their astringent properties, neem leaves help treat white spots on teeth. They contain antiviral, antibacterial, and anti-inflammatory properties, so they have played an important role in keeping your teeth healthy. They help kill off bacteria and prevent oral complications. Firstly, pour a cup of water into a pan. Bring it to a boil and then allow it to simmer for about 5 minutes. Then, strain it before using this solution to rinse the mouth. Make a thick paste from some boiled neem leaves. Then, apply it directly on your affected area. Leave it on for about 10 minutes before spitting it out. Use this home remedy on a daily basis. Baking soda contains natural bleaching properties, so it can be used to remove white spots from the teeth. Besides, baking soda also contains antibacterial and anti-inflammatory properties, so it can help kill off bacteria and reduce inflammation. Mix 1 tbsp. each of baking soda and water to make a thick paste. Follow this remedy once per day. Wet a toothbrush and then dip it in baking soda. Use this toothbrush to remove white spots from your teeth. Repeat this remedy once per day. Basil plant has teeth-whitening abilities and it also helps prevent bacterial infection. According to a study, topical uses of basil can help you get rid of white spots on teeth naturally and effectively. Basil contains antiseptic, antibacterial, and anti-inflammatory properties, all of which help keep the teeth and mouth healthy. Mix 1 tbsp. of basil paste in a cup of lukewarm water. Repeat this home remedy 2-3 times per day. Blend a small cup of basil leaves to create the herbal toothpaste. Then, brush off white sports on teeth using this toothpaste. Using eggshell powder can help in remineralizing enamel, hence removing calcium deposits and removing white spots from teeth. This is because eggshells are rich in essential minerals that have positive effect on removing debris and plaque. Take two eggshells and then crush them to create fine paste. Then, mix this eggshell powder with your toothpaste. 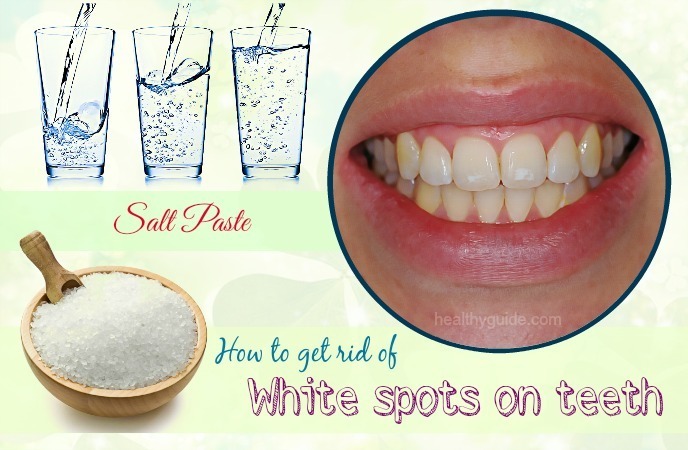 Use this mixture to clean the white spots on teeth. Next, add some peppermint oil to the bowl. Now, brush your teeth with this paste daily as your regular toothpaste. Store the remaining in a jar and it can last up to a few months. According to a study about teeth whitening myths , rubbing banana peel on the teeth can help remove stains. Banana peel is a great treatment to reduce calcium deposits and prevent the plaque buildup from the teeth. It is rich in phosphorous and also contains decalcification properties. These powerful properties penetrate deep into white spots and then break them into smaller molecules. Take a banana peel and then dip it in cold water. Leave it on for 5 minutes before cutting a piece from it. Rub the piece of banana peel on your affected area for about 1-2 minute. Repeat this process multiple times. Follow this remedy on a daily basis until you achieve your desired results. If you are looking for 100% certain way on how to get rid of white spots on teeth at home, then you do not skip this combination. Hydrogen peroxide contains powerful whitening properties. 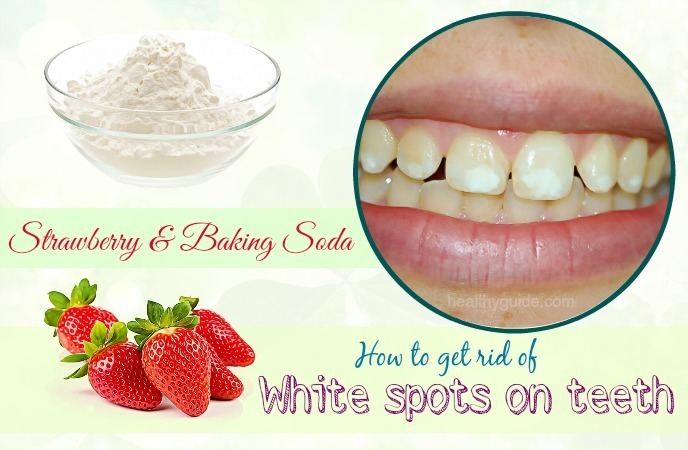 So, when you combine it with baking soda, you can remove white spots from your teeth naturally and effectively. Mix 1 tbsp. each of baking soda and hydrogen peroxide in a small bowl. Brush your teeth with the toothbrush for about 2-3 minutes. Due to its antibacterial agents, peppermint extract helps in preventing the plaque buildup on teeth and simultaneously fighting off the bacteria that cause tooth decay. Meanwhile, the glycerin can help in removing the white spots on teeth. Then, add ½ tsp. of salt and a few drops of peppermint extract to this bowl. Mix them well to create a uniform paste. Do you want to know other effective ways on how to get rid of white spots on teeth overnight? Keep reading this interesting article and then consider applying any of these natural remedies for good. The acetic acids found in white vinegar can help prevent the teeth’s enamel from demineralizing. 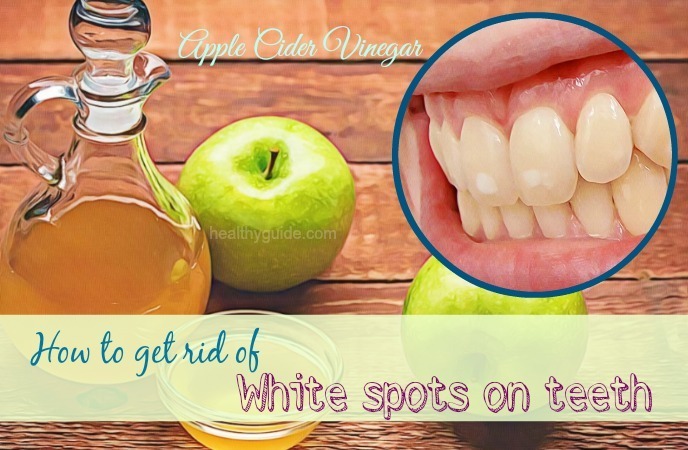 Besides, white vinegar can also help in reducing the plaque buildup and preventing the white spots on teeth. Moreover, white vinegar can also be effective in killing off bacteria in your mouth and treating bad breath. Repeat this process twice daily until these white spots disappear. You can try making the homemade demineralizing toothpaste to help make your teeth healthier. This homemade toothpaste uses natural ingredients that are good for oral health without chemicals. Stir them well while you add coconut oil and mint oil to the bowl. Transfer this paste to a jar and then use it to brush your teeth twice daily. If you want to know how to get rid of white spots on teeth fast by using natural ingredients, you should try using turmeric. Turmeric contains stain-removing properties, making it one of the best ways on how to get rid of white spots on teeth at home. Then, rub this paste directly onto your teeth. Leave it on for about 5 minutes before you brush your teeth using your toothpaste. Repeat this home remedy twice per week. We all know that salt water can clean your teeth and simultaneously improve your gums’ health. Addition to this, salt can prevent teeth deterioration and treat bad breath. Follow this remedy daily for one week. The combination of vinegar and baking soda is a great solution that can help in removing white spots from your teeth. Gently rub this paste on the teeth for 2-3 minutes. According to a research about home remedies to whiten dentures , lemon juice contains powerful properties that help in removing strains from the teeth. 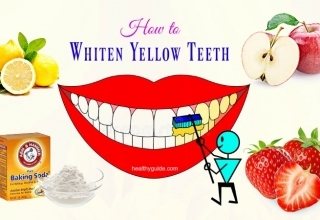 Therefore, the combination of lemon juice and salt can help treat white spots on teeth. Wash off your mouth with cold water. Repeat this home remedy once per day for 2-3 weeks. This sounds strange when it comes to learning how to get rid of white spots on teeth naturally, but it actually does work. Strawberries are rich in vitamin C, which helps cleanse your teeth naturally. Apart from the following remedy, you should consider including more strawberries in your daily diet plan. Firstly, mash up some ripe strawberries to form a paste. Repeat this home remedy twice per day for the best results. Apples are worth mentioning in this list of great ways on how to get rid of white spots on teeth overnight due to their benefits for oral health. Both the fiber and malic acid of apples can help in removing white spots from the teeth. Simply, you just need to consume an apple on a daily basis. 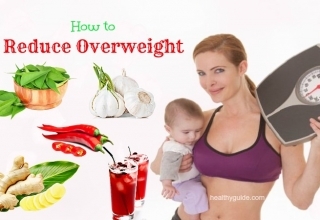 Actually, this is a health advice that you should try out! If you prefer tooth powder to toothpaste when it comes to brushing your teeth, you can consider making a DIY demineralizing tooth powder. Mix calcium powder, Bentonite clay, clove powder and cinnamon powder in a bowl. Then, add Xylitol powder, baking soda, mint leaf powder and your favorite essential oils to the powder. Next, brush your teeth with this homemade tooth powder. Repeat this home remedy 2- 3 times daily. There are some other effective ways on how to get rid of white spots on teeth overnight in this article. 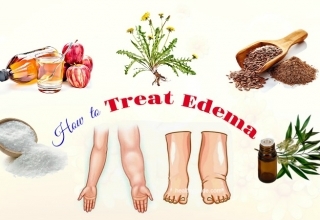 So, you should keep both of your eyes on the remaining of this article and then apply any of these natural remedies for good. Another natural way regarding how to get rid of white spots on teeth fast is using charcoal. You can make use of charcoal to get rid of white spots and plaque buildup on teeth. Baking soda contains natural whitening properties while strawberry is rich in vitamin C, which helps to remove white patches from the teeth. Addition to this, strawberries contain antioxidants that can help in removing stains from your teeth. Now, use this paste to brush your teeth for 2-3 minutes. Repeat this natural treatment once per day for a week. Basil leaves have teeth- whitening properties, making them a great solution for removing the white spots from the teeth. Addition to this, these leaves also help treat bad breath and bleeding gum issues. When you combine basil leaves and mustard oil, you will be able to increase its effectiveness. Blend 5-6 basil leaves to create a fine paste. Use this paste to brush your teeth for 2-3 minutes. Repeat this home remedy every morning for the best results. When it comes to learning how to get rid of white spots on teeth fast, raisins are great options for you. Raisins can help in fighting bacteria that cause plaque and white spots on teeth. Also, consuming raisins creates more saliva, hence reducing the symptoms of dry mouth. Simply, soak some raisins overnight and the next morning, chew them. Another natural way on how to get rid of white spots on teeth at home is consuming citrus fruits, which are highly recommended for oral issues by dentists. Citrus fruits such as orange, lemon, pineapple, etc. are rich in vitamin C, which is essential for good oral health. You just need to wash fruits, and then enjoy them. Just make sure that you chew fresh fruits instead of drinking their juice. There are some healthy foods that you should include in your daily diet plan in order to help in getting rid of white spots on teeth. These healthy foods are packed with essential minerals and vitamins, so they can help enhance your teeth’s enamel. 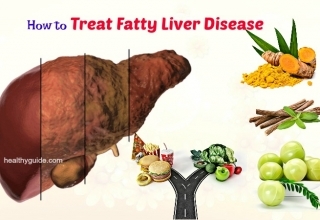 Some great options for you include fish, eggs, meat, dairy products, fish oil, coconut oil, dark leafy vegetables, soybeans, nuts, avocado, etc. According to a research about vitamin D , taking vitamin D is very important for teeth health. You can take vitamin D by being in the morning sun for about 15 minutes every day. If you cannot get enough vitamin D from sunlight, you can try consuming vitamin D-rich foods or taking vitamin D supplements. In regard to learning how to get rid of white spots on teeth naturally, you should try to avoid foods that have high content of sugar. Sugar makes the environment of your mouth highly acidic. Also, it hampers the flow of salivary that contributes to the bacteria growth, resulting in white spots on teeth. Therefore, you should reduce your intake of artificial sweeteners, candies, sodas, etc. Instead, use natural sweeteners such as maple syrup and honey. Consuming acidic foods too much can cause white spots on teeth. This is because these foods can weaken your teeth’s enamel, hence resulting in some oral problems, including white spots on teeth. As a result, if you want to prevent white spots from forming on your teeth, avoid consuming these acidic foods in excess. One of the best ways on how to get rid of white spots on teeth at home that you should know is reducing the intake of whole grains. Although whole grains such as rice bran, wheat bran, wild rice, barley and oats are healthy foods for your health, they are also rich in phytic acids, which can result in white spots on teeth. However, you should not avoid consuming whole grains completely. You can soak them overnight before eating in order to reduce the amount of phytic acids. Keep in mind that smoking and caffeine are not good for your oral health. According to a study, caffeine can damage your teeth’s enamel, hence contributing to white spots on teeth. Meanwhile, using tobacco products can increase the plaque buildup on teeth, hence leading to the occurrence of white spots on teeth. Moreover, both caffeine and tobacco can also cause dark stains on teeth. Brush the teeth twice a day. Use a fluoride rinse daily to keep the mouth clean. This is the last but very important way on how to get rid of white spots on teeth fast that we want to mention in this article. Staying hydrated can help prevent white spots from forming on teeth. According to a study, when you have dry mouth, the pH level in your mouth will be imbalanced, hence allowing bacteria causing white spots to attack your teeth. As a result, you should remember to drink about 1.5-2l of water every day. 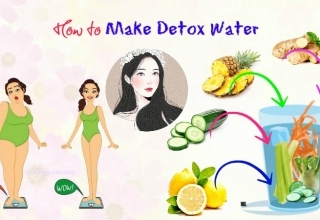 Also, you can drink water-based veggies and fruits such as pineapple, watermelon and cucumbers. 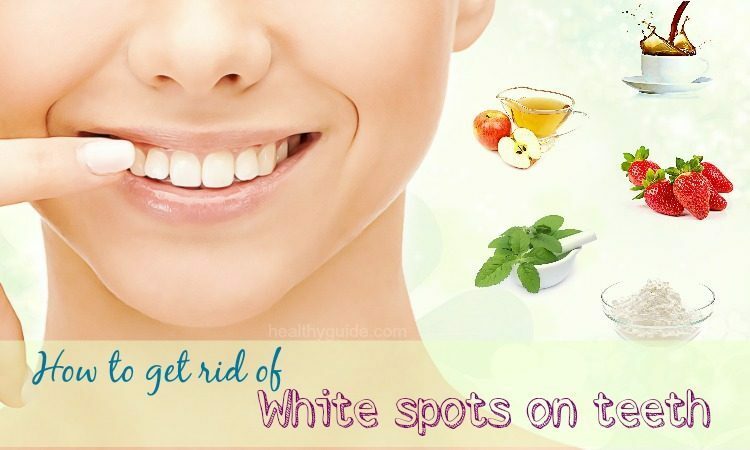 Hope that some of these 34 ways on how to get rid of white spots on teeth naturally are helpful for you. 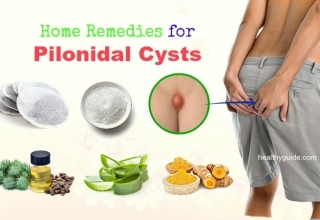 All of these remedies use natural ingredients, so you should not worry about their unwanted side effects. If you have any concerns about this article introduced in Beauty Category, feel free to leave your comments in the comment box below. We will try to reply as soon as possible.